1645. Alice Hopkins returns in disgrace, husbandless and pregnant, to her brother Matthew’s house in the small Essex town of Manningtree. When she left, Matthew was an awkward boy, bullied for the scars that disfigure his face. But the brother Alice has come back to is like a different person. Now Matthew has powerful friends, and mysterious business that keeps him out late into the night. 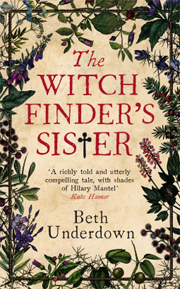 Then the rumours begin: whispers of witchcraft, and of a great book, in which Matthew is gathering women’s names. After the death of her husband, Alice Hopkins has no other choice than to return to her childhood home in Manningtree to live with her brother Matthew. But a lot has happened there while she was away and her brother has changed. They haven’t been in contact for years and Matthew didn’t approve her choice of husband and still hasn’t forgiven her. Little by little Alice discovers that it is Matthew who is behind hunting women and accusing them of witchcraft. But she is horrified when she realizes that Matthew wants her to join him in the quest to find witches. The first part of the book was really slow and boring so I was thinking about quitting but I still wanted to know how it ends. I mean all the action was in the latter half of the book. I wasn’t huge fan of Alice and just didn’t connect with her. I just wished she had more backbone. She was too easily influenced by what others think and would agree with them. Then someone else says this and then she agrees with them and so on. She did got little better at the end and I was happy about the ending. I didn’t get why she would tell Matthew about her pregnancy. It probably wouldn’t have made him any warmer or anything but still. Matthew well… he had his reasons sort of… He is evil person who truly believes in the existence of witches. He really does believe he is doing the right thing. He is not a nice person, I’ll just leave it there. I have to say I didn’t like this as much as I thought I would but everyone else seems to love this so what do I know. But I was just bored and not scared.